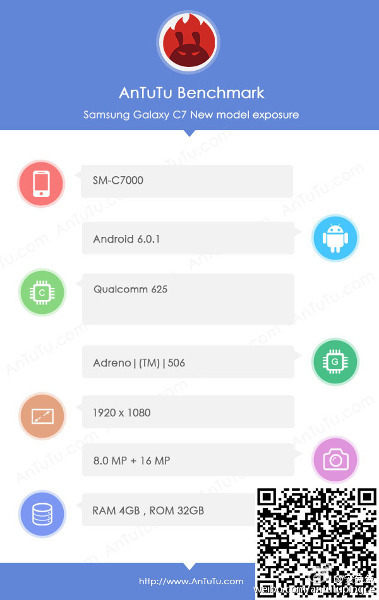 Samsung Galaxy C5 (SM-C5000) with Snapdragon 617 and 4GB of RAM surfaced in Geekbench listing a few days back, now the Galaxy C7 (SM-C7000) with Snapdragon 625 SoC and 4GB of RAM has been leaked by AnTuTu. The Samsung Galaxy C-Series smartphone are expected to come with a metal body, but still don’t have images of any of these upcoming C-Series phones yet. The listing just says it will come with a 1080p display, which could be a 5.5-inch Super AMOLED panel like the A7 (2016). These are chances for it to come with a fingerprint scanner and it will obviously have support for Quick charging, but no details about the battery capacity yet. It scored 60140 points in the AnTuTu 6 benchmark. Since details about two of the Samsung Galaxy C-Series smartphones have leaked, we can expect live images in the coming weeks and the announcement is also expected soon.